And there is someone who spreads her cheerful personality through her innovative recipes, interesting anecdotes, and beautiful photographs and she is our one woman wonder Sanjeeta of a stunning blog called Lite Bite. True to her blog name, Lite Bite is a treasure trove of healthy recipes and beautifully styled photographs that will leave you in awe! From simple home cooking to fusion cooking, Sanjeeta’s tremendous talent shines through her blog where she easily transforms the not so healthy food into light, delicious and flavourful affair. You can’t help but marvel at her unique recipes that will make you wonder why you didn’t think of cooking it before?! 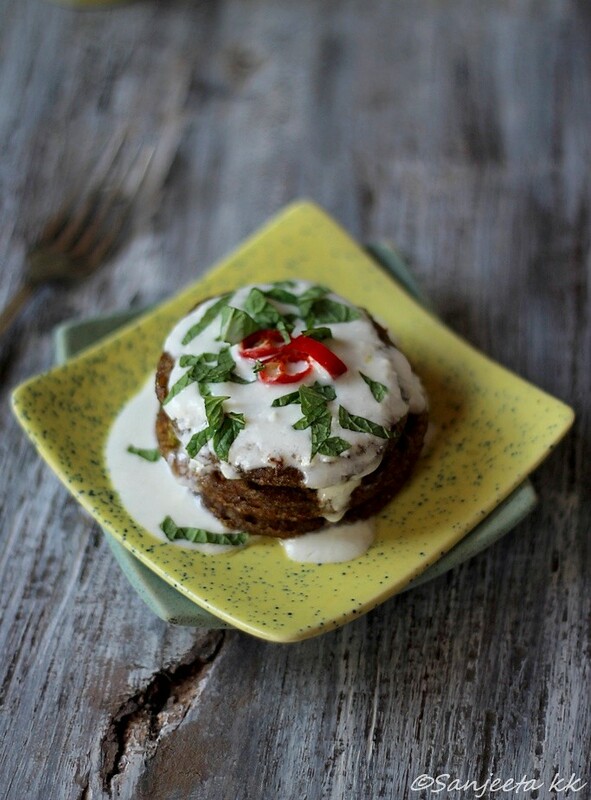 Lite Bites is full of innovative and delicious recipes that demonstrates eating healthy and balanced food doesn’t mean one needs to compromise on taste, flavour and comfort. I feel honoured and privileged to share my virtual kitchen with Sanjeeta today who is going to share another ‘lite bites’ from her amazing recipe repertoire with us. 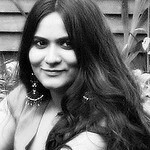 You can follow Sanjeeta on her Facebook page, Twitter, Pinterest and Google+. Food blogging is the ultimate hobby I could indulge in for hours on end. A captivating hobby turned into a full-time passion now, which fills me with excitement and self-worth every single day. Food blogging gives me endless entertainment, raises curiosity, creates memories and helps connect with wonderful online friends to grow together. For many people, food is just fuel for body and an everyday comfort to celebrate life. To a food blogger ‘food is a subject’ which they seek to understand and explore. They don’t just eat good food but are inspired by it and visualize many forms of art in it. They take food to a different altitude. Violet curvy aubergine, deep orange pumpkin, vibrant red tomatoes, tender green dill, blushing beets with leaves…my heart jumps out with joy every time that I visit my farmers market and gaze at these fresh and colourful vegetables stacked neatly in a row. I may not know how to cook pearly strings of fresh green peppercorns or the cute little crimson water apples. But then, I never miss a chance to buy the same so that I can photograph and preserve the beauties of these delicacies for future reference. Food mesmerizes and brings out the creativity in you. I was in for a pleasant surprise when Sia asked me to write a guest post for ‘Monsoon Spice’. 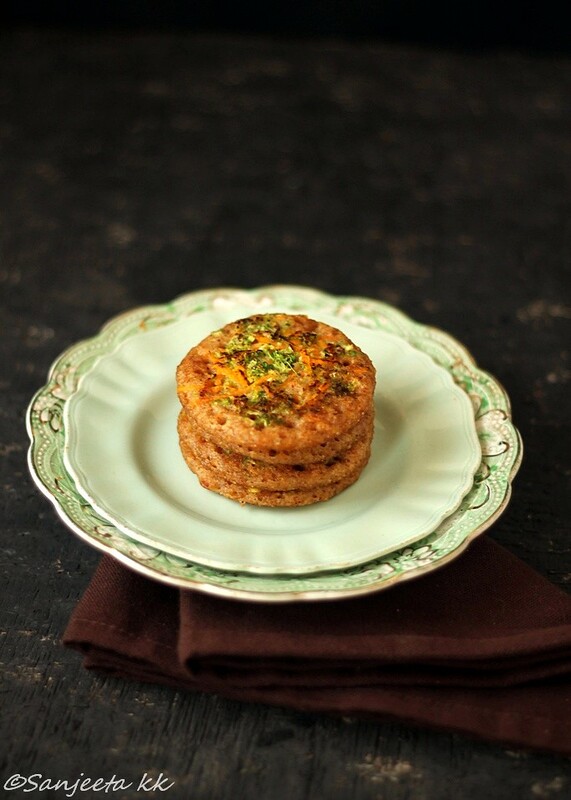 Her blog has a sweet charm, a rustic Indianness which permeates through all her recipes. Her spellbinding food stories, traditional Indian recipes and beautiful photography have the power to connect with readers. It is an absolute pleasure to come over to one of my favorite Indian food blogs and share a recipe. Food blogging has completely changed the way I look at the food I cook and eat. A millet roti was just another ordinary Indian flatbread way before my food blogging days. The thought of baking or using the grain in any other form never crossed my mind. I planned a Millet recipe for this post. I have been incorporating a lot of millet in my meals off late. The humble grain shares love and hate relation with my children. A millet roti gets thumbs down while a millet brownie or dal dhokli gets a warm welcome at home. To me, Millet brings back the childhood memories. There was rarely a trip to my grandmother’s home when she doesn’t treat us with her thick hand-patted bajra rotis (millet flatbreads) poked with a knife and generously drizzled with homemade ghee. My face still lights up at the mention of ‘bajra rotis’, but alas my children are not one with me. This is when I thought of trying out err.. rather disguising the grain in a dish they love to eat. Pancakes…and pancakes with millet it is. 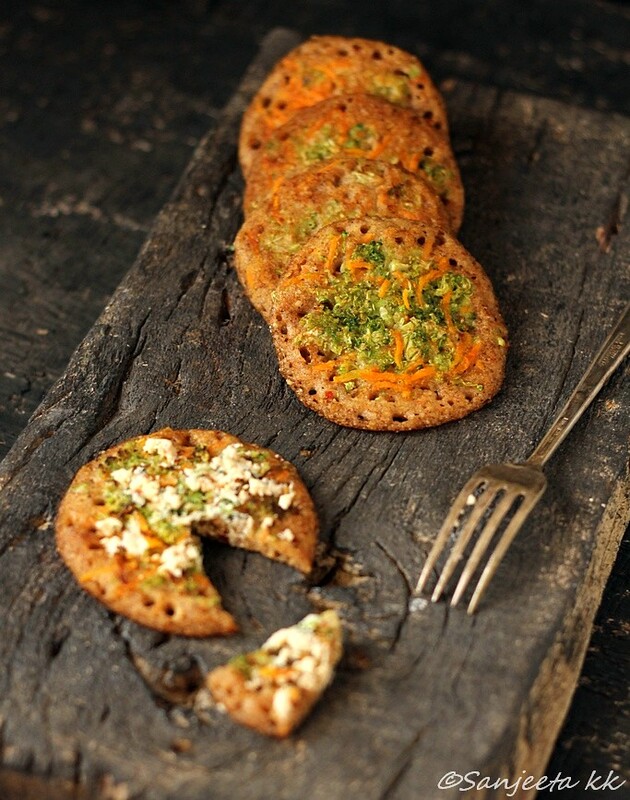 I used multiple millet grains to make these savory pancakes and served it with garlic-herb cottage cheese spread. 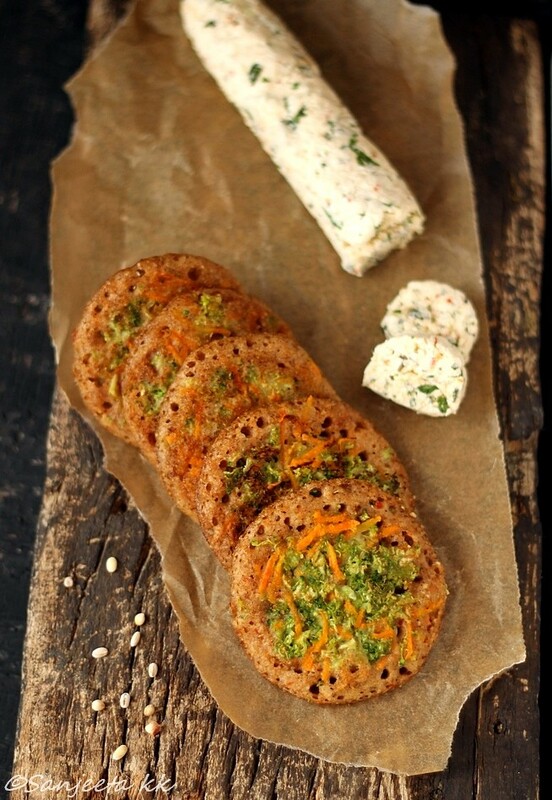 Oh yes, if you have a cheese lover at home, try adding a little grated cheese on these millet pancakes and see them disappear before your eyes. 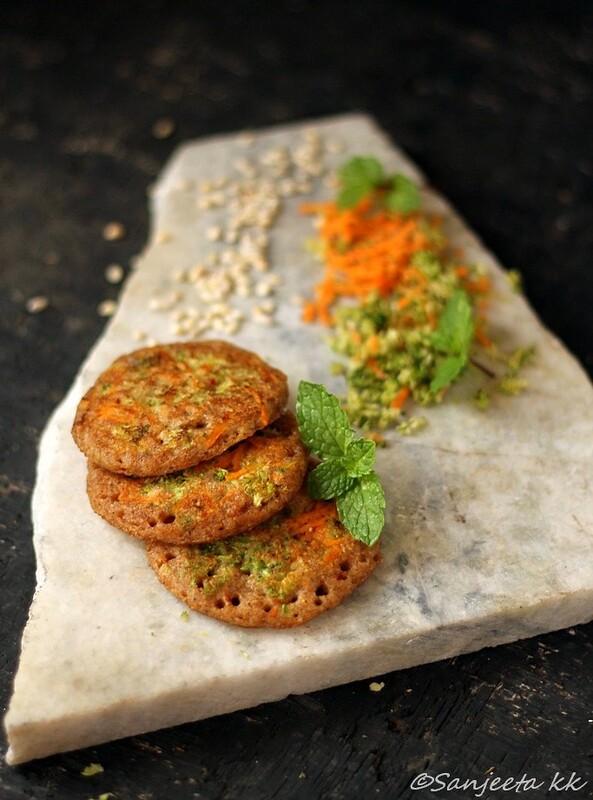 Needless to say, these multi millet pancakes receive a warm welcome on my dinning table every time these are served. I have used a combination of three millets (Sorghum, Kodo and Pearl millet) and Barley in this recipe. Wash soak all millet in clean water overnight. I do keep millet flour and use the same when I am hard pressed for time to soak it. But I prefer soaking the grain as it begins the ‘sprouting process’ in the seeds which makes it more digestible and help obtain the nutrients in the food. Peel and grate one carrot, a small piece of ginger and a few florets of Broccoli. Drain the water and grind the millet with yogurt into fine batter. Add a little water if you feel the batter is too thick. The batter should be of pouring consistency. Take out the millet batter in a large bowl, add pepper powder, grated ginger, salt and combine well. Heat a griddle, pour a ladle of millet batter on it and drizzle a few drops of oil around the pan cake. Add grated carrot, broccoli and sesame seeds over the pan cake and cook for 1-2 minutes on medium heat. Flip the pan cake and cook the other side also for a minute. Make all the pan cakes in the same way. 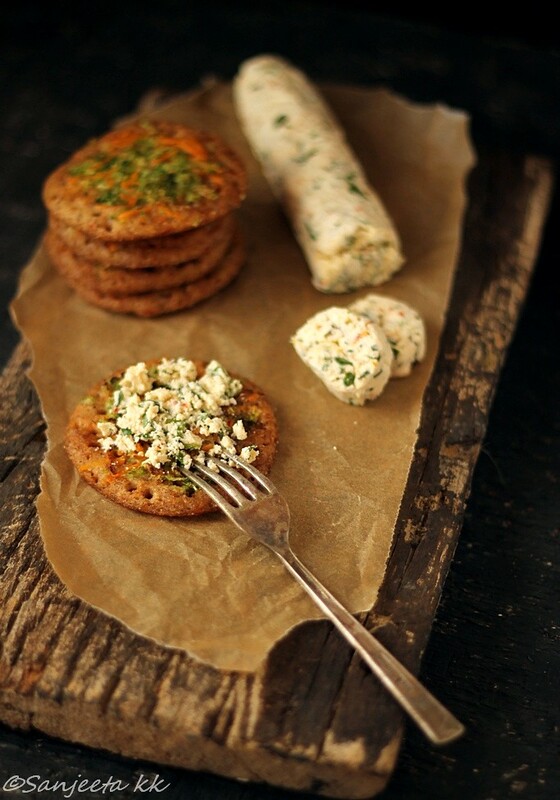 Serve the savory millet pancakes with herbed cottage cheese spread, green mint-coriander chutney or chilled yogurt Raita. Cottage cheese has a bland taste but you can churn out a delicious spread by adding a few aromatic herbs and spices in it. Make fresh cottage cheese using about one liter of milk. Hang the cottage cheese in a muslin cloth and let it drain completely. Wash and finely chop mint leaves. Peel 3-4 garlic pearls and finely chop them. Grate the outer skin of lemon using a very fine grater to get the lemon zest. Place the cottage cheese in a bowl, add all the ingredients listed above and combine well with a fork. Take a large cling film and place the cottage cheese mix over it. Spread the cottage cheese using your hand to make a large cylindrical shape. Wrap the cling foil tightly over the cottage cheese cylinder and refrigerate it till use. It stays good for 4-5 days when refrigerated. Take out the cottage cheese, remove the cling film and cut the log into small slices with a sharp knife. 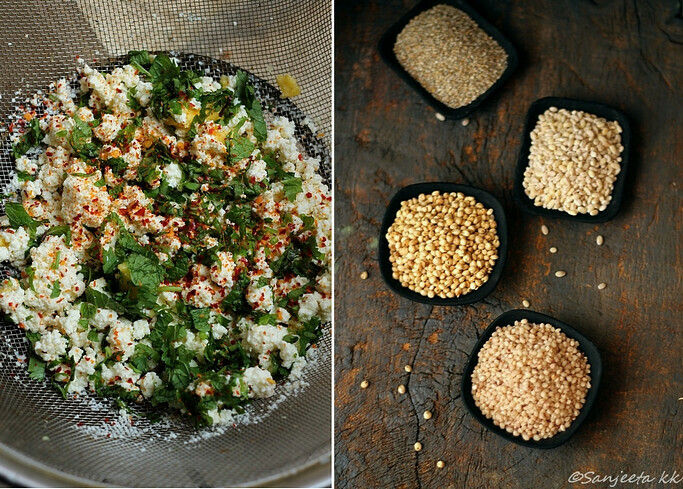 Serve it with millet pan cakes. The recipe can be made using millet flour also. Combine various millet and grind it into fine powder. Soak millet flour in yogurt for 3-4 hours before making these pancakes. Add flaxseed powder mixed with water to the millet flour for better binding. A few tablespoons of chickpea flour or wheat flour added to the millet batter gives a good texture to the pancakes. Using millet powder to make these pancakes is a great time saver. I always keep a stock of millet flour when I don’t have time to soak. Soaking a grain is always preferable as it increases the nutrient content considerable. I have used a combination of Barley, Sorghum and Kodo millet in this recipe. You can also make the same pancakes using just one kind of millet of your choice. Use vegetables of your choice as topping for the pan cakes. Avoid yogurt and replace it with plain water for a vegan version of the recipe. They look ever so mouthwatering! A wonderful recipe. Pleasure is mine, to come and share your beautiful online space, Sia! Hugs. Never tried millet before. But your excellent photographs make me to try it. Thanks Sanjeeta.